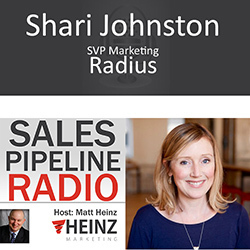 Our guest is Shari Johnston who is the senior vice president of marketing at Radius and has an illustrious career in marketing. At some point we are going to talk about Santa.com I promise but before we get to that we will talk a few other things. Where are the places that you are putting bets on to drive marketing results in 2017? What are some of the best practices you see working that can help B2B companies continue innovate and be successful and proactive on the acquisition side but really to take a full lifecycle, full lifetime value approach to the customer? What does it take to run and execute marketing in that fast-paced environment where you are expecting and hoping, the entire company wants fast results but that doesn’t always jive with buying cycles, doesn’t always jive with just what it takes to do marketing, right? How do you balance that tension? What about the cultural changes that are sometimes involved in helping organizations, helping sales, helping executive team, helping a board rethink how to look at what marketing is doing more on the quality versus quantity standpoint? Were there any growing pains or I guess like migration pains as you moved the way marketing is perceived from a volume-based story to a quality at conversion-based story? Was that difficult for even sort of sales counterparts let alone C-suite and board to understand and get behind? Listen to the show for the answers and more.